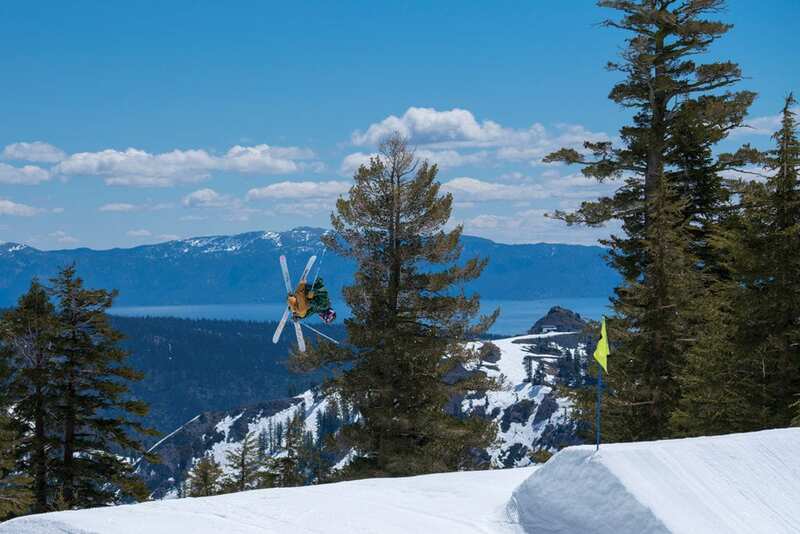 Colossal terrain parks were once all the rage at Tahoe ski resorts. Lined with towering jumps that grew larger by the year, they provided training grounds for rising pros and social hubs for throngs of daring young snowboarders and freeskiers launching, sliding, mingling and feeding off each other’s energy. As revelers lapped the park, upping the ante and fueling the movement with each technical trick, bravado was the name of the game. 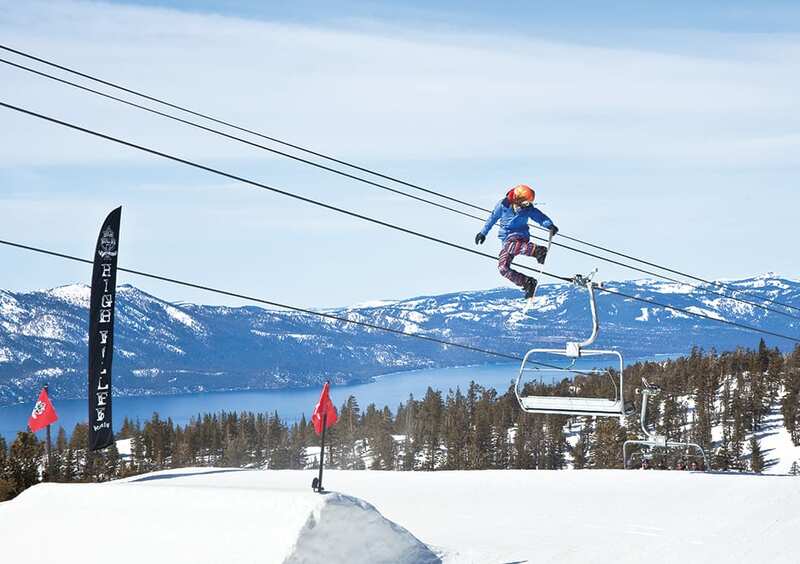 Tahoe resorts embraced the trend, welcoming waves of new passholders and weekend guests as sprawling terrain parks became the norm. 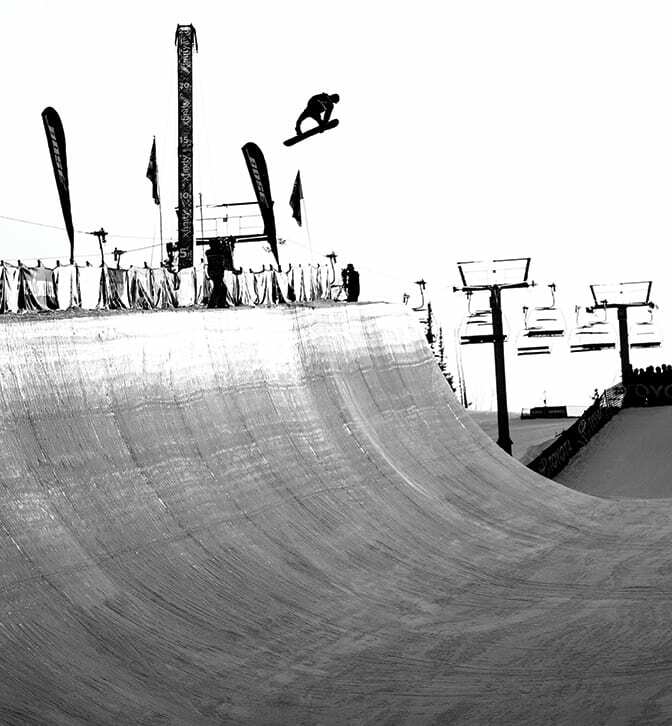 Park crews built features to impossible heights, and 100-foot-long “Hollywood” jumps and supersized halfpipes inspired athletes to push the envelope, enthralling crowds of spectators. 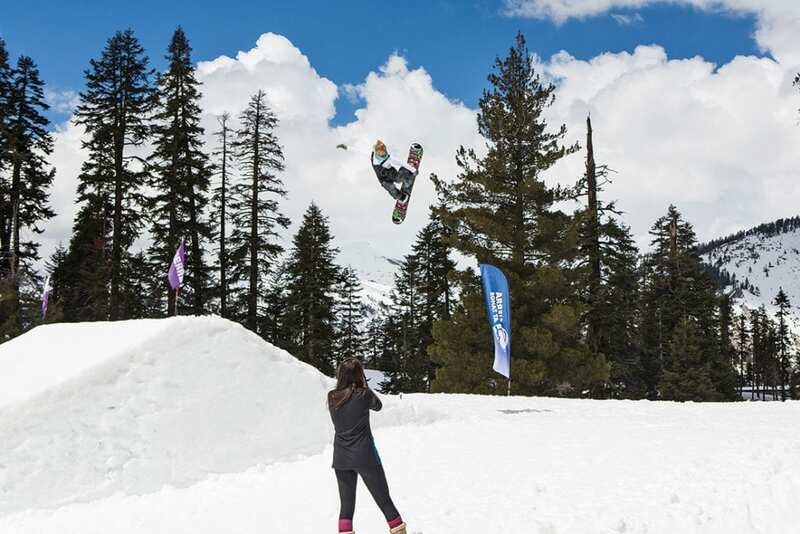 “Tahoe became a mecca for freestyle skiing and snowboarding and was at the forefront of big terrain parks,” says professional freeskier Kyle Smaine of South Lake Tahoe, who, at age 27, was an aspiring youth when the trend was in full swing from the late 1990s through early 2000s. In the years since, however, the landscape has changed. Massive jumps have all but vanished from Tahoe’s remaining terrain parks, while the hordes of skiers and riders who once dominated parks have been replaced by small bands of diehards interspersed with curious newcomers. There are many reasons why resorts backed off on the sheer size and number of terrain parks. Among them: liability, the cost to build and maintain large features, unpredictable weather and a declining number of users. 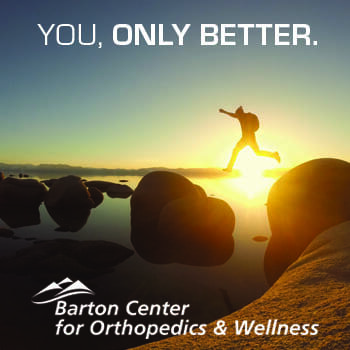 As terrain parks gained popularity and resorts competed to build the biggest features possible, the number of injuries and lawsuits rose in accordance. At 37 years old, professional snowboarder and 2006 Olympic halfpipe team member Andy Finch cut his teeth during the early heyday of terrain parks and halfpipes—first at Sierra Summit (now China Peak) in the central Sierra Nevada in the mid to late 1990s, and later in Tahoe after moving to Truckee in 2003. Finch witnessed firsthand the emergence of parks and pipes, which coincided with snowboarding’s boom, and was a proponent for the increasingly larger features at his home resort. While Finch was all for park crews building large, intimidating features in his younger days—thus keeping the beginners on the periphery—he also concedes that jump designs have evolved for the better over the years. “Back then we just kind of made something out of nothing. They’d push up a takeoff and have a massive wall right before your landing. So there was more risk then,” Finch says. “I think it scared some people away. On top of the increased liability associated with giant features, once terrain parks became resort fixtures, their expenses also became apparent. Building large terrain parks involves a team of experts, and complex features like halfpipes require specialized equipment and training to effectively shape and maintain. “Resorts have to have someone checking the landings, rails and transitions. There are all sorts of factors that contribute to the cost of maintaining a park,” says Cooper. Large terrain parks and pipes also demand a significant amount of snow, and weather plays a big role in how and when they are built. During drought years, resorts rely on snowmaking. Between the costs of electricity and water, the numbers add up fast, says Cooper. Mountain managers monitor water usage and gauge forecasts to ensure that temperatures remain cold enough to preserve the freshly made snow. If the weather warms, as it’s prone to do in Tahoe, the snow melts, the park features wither in the balmy air, and the money spent on labor, time and energy to build that park is wasted. Stormy seasons can be just as costly. When a storm approaches, park crews prepare by removing features such as rails and boxes and closing off jumps. All of the features must be dug out and rebuilt after the snowfall. It’s a balancing act made more challenging in an era of fickle winters defined by extremes. The boom-or-bust winters in Tahoe are the primary reason that Sugar Bowl has not built an expansive park in recent years, says Slaughter. Starting the 2011-12 season, the region endured five consecutive years of severe drought. The dry stretch was followed by one of the snowiest winters on record in 2016-17, then another low-snow year in 2017-18. Such extremes are not conducive to building and maintaining parks. “I think the scale-back that you’ve seen with terrain parks has been more a matter of snow and manpower than it has been a conscious decision to scale back on the parks,” says Slaughter. Much has changed in skiing and snowboarding over the last two decades. On the heels of snowboarding’s meteoric rise throughout the 1990s, the sport plateaued in the early 2000s and declined in participation in the ensuing years, according to data from the National Ski Area Association. Meanwhile, new ski and snowboard design and technology enabled resort-goers to venture outside of groomed terrain with greater ease. And while the novices expanded their territory, so too did the old guard who once pushed for the large terrain parks as young rippers. With fewer people gravitating to the parks and halfpipes—which grew in size along with the jumps, until reaching the current 22-foot Olympic standard—the giant features that were once staples across the Tahoe Basin dwindled. In their place are smaller, less daunting features geared toward beginners and families. 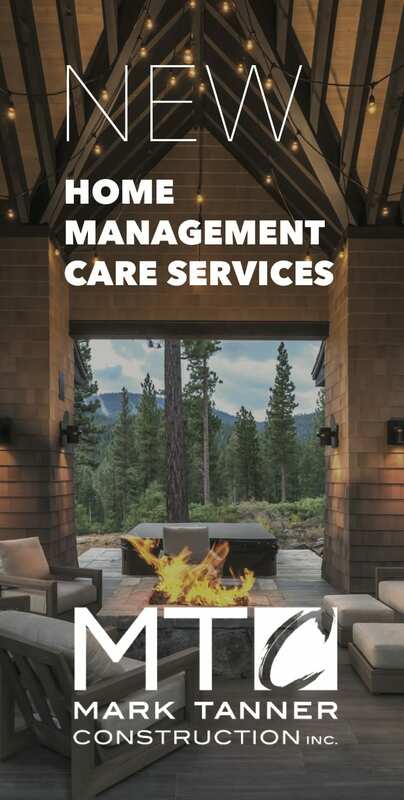 The goal, says Sarah Sherman, communications manager at Sierra-at-Tahoe, is to adapt to the industry’s changing clientele, which has grown more diverse over the years. “We work hard to provide varied terrain for everyone,” Sherman says. “Whether they’re beginners looking to catch their first air or one of our Olympic athletes training for their next competition, our goal is to enable guests to safely progress their skills and learn new ways to enjoy the mountain. One of the early mountains to build terrain parks on its slopes, starting in 1993, Sierra-at-Tahoe continues to build eight different terrain parks with up to 125 features, says Sherman. 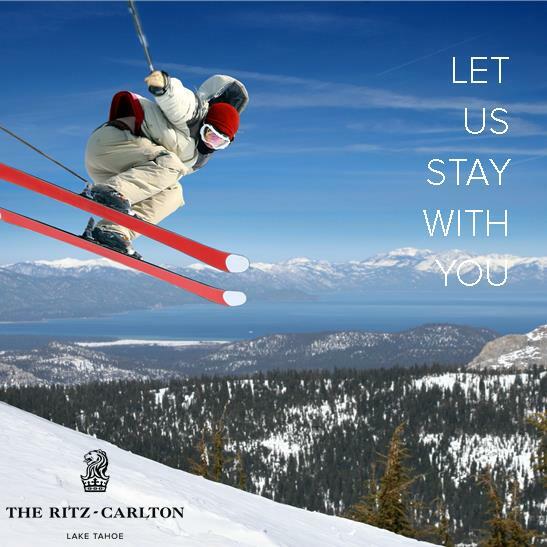 It also lays claim to Tahoe’s most impressive lineup of professional freeskiers and snowboarders. 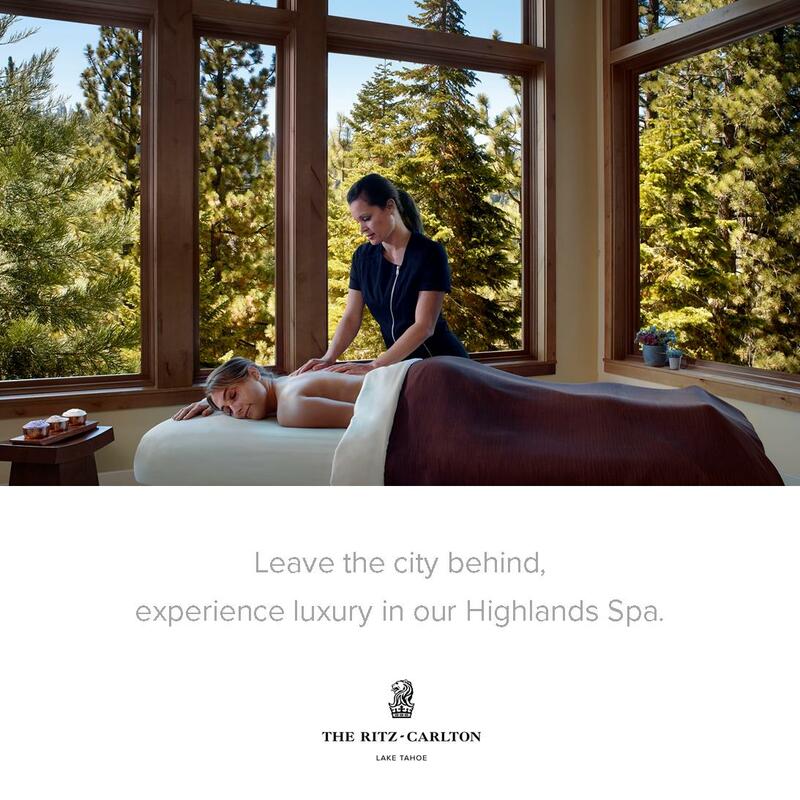 Jamie Anderson, the two-time defending Olympic gold medalist in snowboard slopestyle, and halfpipe skier Maddie Bowman, who won gold in the 2014 Olympics, both grew up on the South Shore and credit Sierra-at-Tahoe for the solid base that launched their careers. The resort sponsors several other high-level athletes as well, including snowboarder Hannah Teter, the 2006 Olympic halfpipe gold medalist, and Smaine, who narrowly missed qualifying for the U.S. Olympic halfpipe ski team last season. 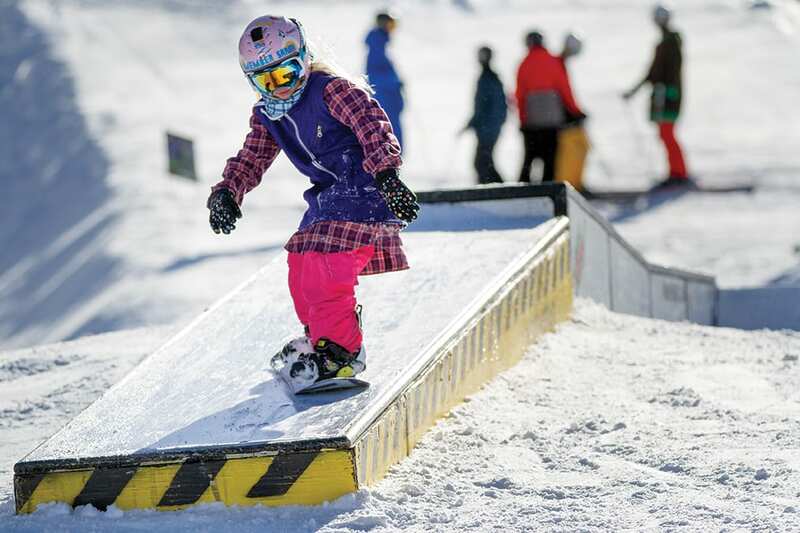 Other Tahoe resorts with strong terrain park traditions are also carrying the torch on the North Shore—although with a refined strategy. 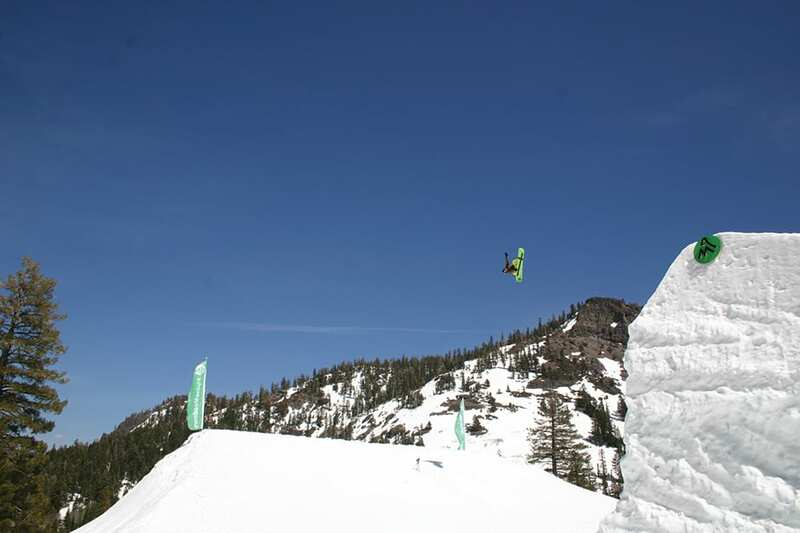 Like Sierra-at-Tahoe, Boreal has long been at the forefront of the freestyle movement. With the 2012 addition of Woodward Tahoe—an indoor training center at Boreal that offers trampolines, ramps and foam pits for athletes to hone technical tricks—the small resort on Donner Summit continues to stand as a beacon for park skiers and snowboarders looking to blossom in the sport. “Snowboarding was basically pioneered, at least in the freestyle aspect, here on Donner Summit between Donner Ski Ranch, Soda Springs and Boreal,” says Tucker Norred, Boreal’s marketing and communications manager, adding that the resort began building an official terrain park in 1992. Northstar’s longtime terrain park manager, Mike Schipani, is among the most experienced park builders around. Starting at Northstar in 2002, he’s also worked with Snow Park Technologies and built features for the Winter X Games and the High Cascade and Windells summer camps in Oregon. While fellow Vail Resorts Heavenly and Kirkwood have reduced their terrain parks in recent years, Northstar continues to provide a vast array of freestyle offerings. Schipani says the resort builds 150 to 200 park features each season, regardless of snowpack, and up to 280 features when snow is abundant. And while the resort does not build a 22-foot superpipe, Schipani adds, Northstar does provide an 18-footer, which was the previous standard for a superpipe. The resort also has multiple mini pipes and creates parks for a wide range of abilities starting at the novice level. Another major change since the early days of terrain parks is the design of the jumps. As Schipani notes, modern terrain park jumps are built smoother and smarter, with better takeoffs and longer, more forgiving landings. “Jump design has changed significantly over the years,” Schipani says. “The lengths of jumps aren’t as much of a focus as they were in the late ’90s and early 2000s, when everyone was pushing for that bigger jump. Now it’s all about good, solid jump construction that allows for certain tricks because of hang time. As professional freeskiers and snowboarders continue to push their respective sports, performing increasingly difficult tricks, specialized training has become a must. The era when high-end athletes simply took their lumps learning new tricks in terrain parks and halfpipes is a thing of the past. “The top-level pro tricks used to be attainable by your local ripper. Now, you’d better have your family investing in some serious training camps with foam pit training and all that,” says Finch. This new reality further forces the hand of resorts to cater to the average Joes, who far outnumber the elite athletes capable of riding competition-sized features. 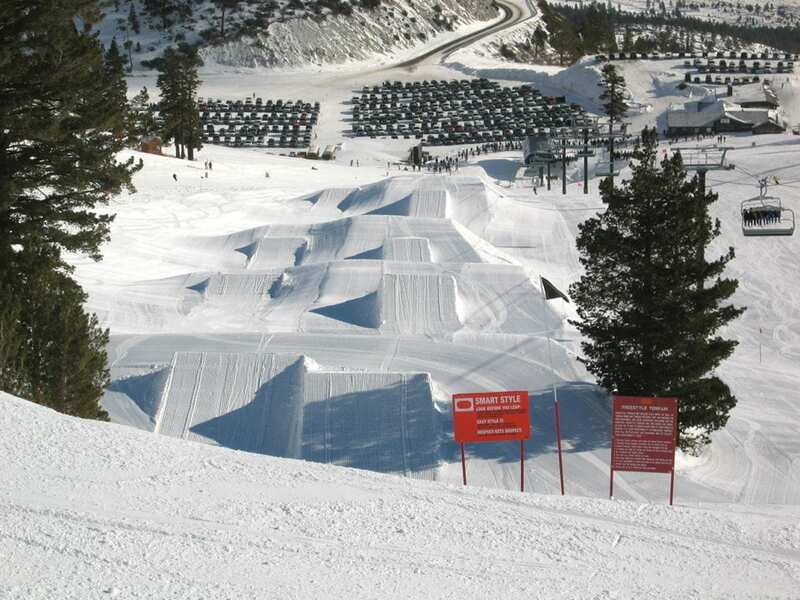 As a result, few resorts across the country regularly build and maintain a 22-foot superpipe. 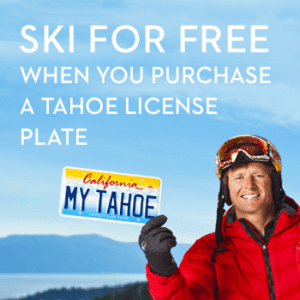 In California, Mammoth Mountain stands alone in that department, although Northstar and Squaw Valley have the capabilities and will on occasion. Northstar last built a 22-foot superpipe five years ago, while Squaw built one toward the end of the big 2016–17 season, says Liesl Hepburn, Squaw’s public relations director. “When we have abundant extra snow to work with and lots of time left in the season, then we go for those bigger features like the superpipe,” says Hepburn. Smaine says the absence of full-size competition features throughout the season has forced many pro athletes to leave Tahoe. While he still lives on the South Shore, he travels to Mammoth for training. 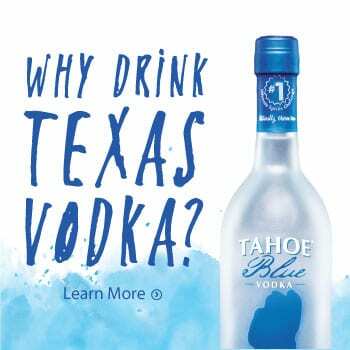 Other big-name Tahoe athletes such as Anderson, Bowman and David Wise—from Reno—also travel to resorts such as Breckenridge, Colorado, and Park City, Utah, which cater to Olympic athletes. In October, park managers from resorts all over the nation gathered at a retreat in South Lake Tahoe to deliberate the future of terrain parks. Michael Bettera, the leader of the retreat and owner of Effective Edge, a resort and terrain park consulting company, says viewership of the 2018 Winter Olympics demonstrated that snowboarding and freeskiing are still popular. Spectators clamor for the incredible feats performed by the top athletes in these sports. “Almost 50 percent of the entire Olympic viewership was for the disciplines of snowboarding and freestyle skiing,” Bettera says. 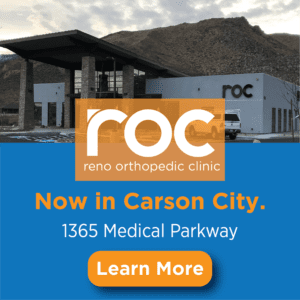 And while the majority of those viewers will never drop into a 22-foot superpipe or an Olympic-sized slopestyle course, they will try their hand at the small to moderate features that have become the focus at Tahoe resorts. It is this realization that has caused the ski resort industry to rethink the way it builds freestyle terrain for its guests, with renewed efforts focused on the everyday rider. With this new model, the hope is that the energy that once defined the terrain park scene will return. Slaughter says Sugar Bowl invested $3 million in its snowmaking system this past summer, with a large portion of the upgrade applied to its terrain park areas. Terra Breeden is a freelance writer and instructor at Sierra Nevada College. When not writing or teaching, she’s likely exploring the mountains around her South Lake Tahoe home. Tahoe Quarterly editor Sylas Wright once considered himself a park rat. It has been many years since he could make that claim. While I completely understand the resort’s financial position on building terrain parks, hosting competitive freeskiing events can justify the spend. You don’t have to look too much further than a resort such as Cooper Mtn, CO. Between the Revtour, World Cup, and USASA Nationals (all taking place during off peak periods), they keep their beds full, F&B plump, and are rewarded with millions of dollars worth of advertising impressions. The Olympic Valley Freestyle Freeride team (AKA Squaw Free) is absolutely stacked with ripping athletes. Wake up Squaw/Alpine; build them a real park & pipe! Host a few events, and earn your right to claim a local athlete(s) as “one of your own” when they are standing on an Olympic podium.